Wait, Victor Cocktail with Vermouth, Brandy and Gin, that is strangely familiar… Maybe, because I made it just two drinks ago. Another fine example of the level *cough* care *cough* taken in transcribing and editing the Savoy Cocktail Book, there is the exact same “Victor Cocktail” on pages 167 and 168. So, fine, a second chance to make this one, and I will not cheat and make it with Genever or Old-Tom, I will make it with a London Dry Gin. OK, THE London Dry Gin, as far as I am concerned, Tanqueray. Well, it isn’t as bad as I feared it would be, there is actually something interesting about this combo. But I would still declare the Victor made with Bols Genever Victorious. The Genever just makes for a more interesting taste combination. 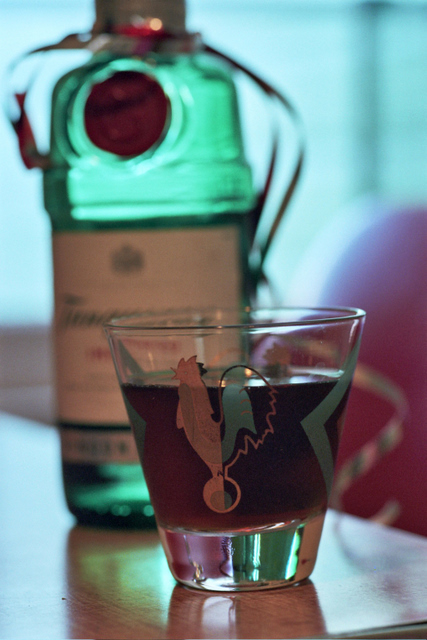 *The half bottle of Tanqueray Gin used in this cocktail was sent to me by a firm promoting the brand, and, as you may have read on other blogs, the putative birthday of Charles Tanqueray, alleged inventor of the gin.